You want to copy several items and links from the internet. Now, imagine being able to copy multiple links off a site to another window without manually copying each of those links, pasting them to your document window, going to and fro in between windows to copy each item, one by one. Imagine your process without the hassle of an outdated and backwards copy-pasting experience. The good news is: it’s totally possible. The copy and paste function has remained largely basic, even though the very same function is widely and often used by probably everyone who uses a computer. The way it still is now, copying and pasting is tedious and bothersome, and there has been no native developments in Mac to facilitate a better experience. It’s a good thing that some developers saw this huge deficiency and developed what’s now the clipboard manager, or a clipboard buffering app that empowers the users by allowing them to copy several (and for some apps, infinite) items off the internet, recording them in a clipboard, and pastes those at your command at a later time. Jumpcut was designed by its developers for providing “quick, natural and intuitive” access to the user’s clipboard history, and in that sense, the app is simple and straightforward enough. Notably, its minimalism can be taken for a lack of UI/UX sense. After installation and launching the app, any text item that you cut or copy will be piled on a “stack” of clippings that can be accessed under the menu bar or through a pop-up that’s activated by pressing a customizable hotkey. Once you’ve selected a text from there, Jumpcut places it in a pasteboard and attempts to automatically paste it where you position your cursor. The clipping will still be viewable in your stack, and you can navigate that by fiddling with your arrow keys and Home and End buttons easily. You can decide not to paste your selection by hitting escape. Jumpcut is open source and can hold up to 100 copies, while a quick view of the menu bar lets you see up to 40 of your latest clippings. The downside is that Jumpcut is limited only to your links and text, and has no ability to work with images. Nevertheless, it’s still quick and handy for heavy-duty copy pasting, way better than your ordinary old school method. 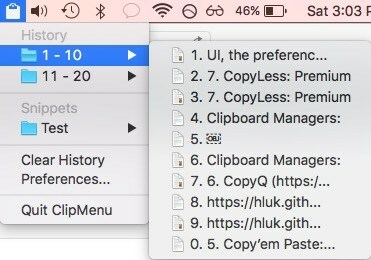 ClipMenu does not have the same limitations you get from Jumpcut: it can have as many history items on its clipboard as you want depending on the value you set in the preferences menu, the default value being 20. Outstandingly, unlike Jumpcut, ClipMenu can record images in its clipboard. Hold your horses there though, as it can only support recording images in the TIFF and PICT format, and not any of the more common formats such as PNG, JPG or BMPs. The choice of image format support ClipMenu has is honestly mind-boggling to us, because TIFF and PICT are hardly used by the common computer user, almost rendering its image support useless. Anyhow, you’ll find that ClipMenu can support other clipboard types too aside from text and links, such as PDFs, RTFs and RTFD, so if you find that copying these files are in your horizon, this might be the clipboard manager for you. ClipMenu, however, also has an automatic organization function that lumps your copied items into folders, and that may turn out to be your cup of tea or just end up jumbling up your content and hindering your productivity. It has an additional snippet feature that can manage re-usable text as a snippet that you can do by copying and pasting it anytime from the menu, which is also accessible via the same ways JumpCut is. We’re so-so with this app, but it does get the job done and we still highly recommend using this one. 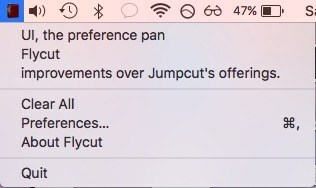 Opening Flycut for the very first time will give you a major case of deja vu, because the app looks suspiciously the same as Jumpcut–from the user interface, its preference pane and the pop-up bezel. As with Jumpcut, Flycut can only hold up to 100 clippings, the same inability to copy and paste images, and the ability to display only the last 40 items copied, just like Jumpcut. 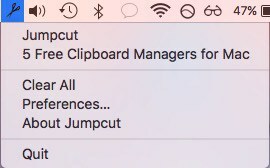 That is to say, like Jumpcut, Flycut is also a clean and simple clipboard manager, but packed with neat improvements that gives it that slight edge over Jumpcut. Flycut comes with more customizable and just the smidge more powerful options, such as the choice to have it automatically remove duplicate clippings. 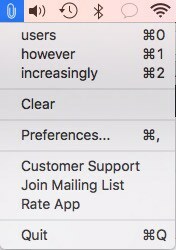 This feature is highly desirable if you tend to work your hotkeys fast or are working with multiple links at the same time and tend to get confused. Flycut also comes with the option to customize the height of your pop-up window that opens up after keying up your hotkeys. The clipboard can also be navigated with the arrow keys, and remove items through the Delete button. It basically operates the same as Jumpcut, which also automatically pastes your clipping of choice at your cursor position at the moment. As an additional feature, you can now sync your clips and general settings in Flycut through Dropbox, so there’s no work and data lost if you switch between Macs. Clipboard managers largely operate in the same way, and CopyClip does the same job as its counterparts, while also offering the same functions, such as the ability to remember an infinite number of copied texts that you can customize in your preference setting. But the most unique feature CopyClip has is the ability set blacklisted exceptions. Users are able to set blacklisted apps from which CopyClip cannot record from. This feature is obviously for security reasons, geared towards users who copy and paste their passwords regularly (for Mac users who do this, we strongly advise against it, and to use Mac’s servicable Keychain Access app to prevent any security problems you yourself may cause). This way, a user can control the outflow and inadvertent leak of their more sensitive data. Another cool new feature of CopyClip, for MacBook Pro users who want to upgrade their experience, is that it can automatically display your clippings in your Touch Bar, which makes accessing your clipping history easier and handier. CopyClip’s improved version is a paid one, however, but you can get all of its most basic features for free. Among all the apps in this list, 1Clipboard is probably the most eye-catching, literally. It does the same job as all its other clipboard manager counterparts, and while each may have minute advantages over any other, 1Clipboard simply provides the best user interface over any item in this list, although that’s not saying much. Still, interacting with an app with a good UI is very much part of the app experience, and that’s why 1ClipBoard is clearly a standout. It is also open source, and boasts of some really good features as well, like a search function over your clipboard history and the ability to star your favorite clippings so that you can pull them up easily when you need them. 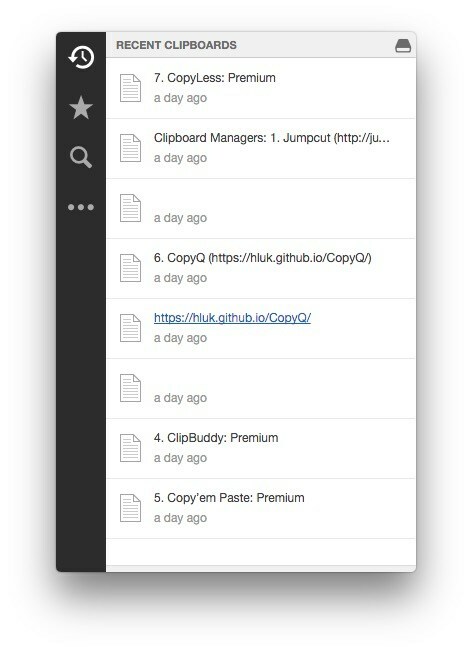 1ClipBoard also has the option to sync your data in Google Drive across your computer and devices, in real time, and not just across your Mac devices. A major flaw in 1Clipboard is the hassle of having to manually paste your content from its manager or by pressing “Command + V” unlike other clipboard managers that automatically pastes content that a user has selected in the menu. This marginally lengthens the clipping time and the productivity you want to get from your clipboard manager. This can get annoying, but arguably, 1Clipboard can be worth the hassle. Try any of these out, and you can better manage the way you copy and paste, making your computer experience a bit more efficient and hassle free. Clipboard Managers really go a long way in minimizing the need for switching from windows to windows, individually copying and pasting each new data to their desired destination. By using any of the apps we’ve listed for you above, you can just copy away all you want, and pull the data up whenever you need and paste it at your own convenience. Of course, any of the above app have their own advantages and limitations, and it’s up to you to choose which feature you value over the other. We’d love to hear the clipboard manager you’ve managed to jive with, and how it has come to change your experience in navigating your computer and the web. At the very least, we hope we solved some of your problems. 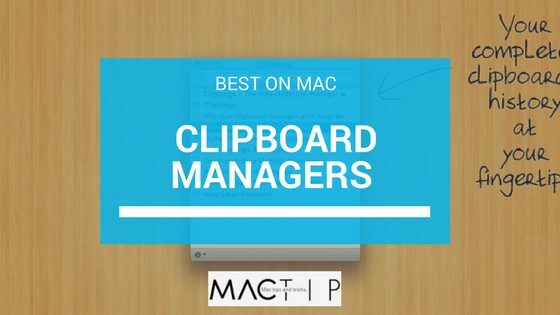 If you used and liked any of these clipboard managers for Mac, let us know what you thought! Share your thoughts with us by commenting below.